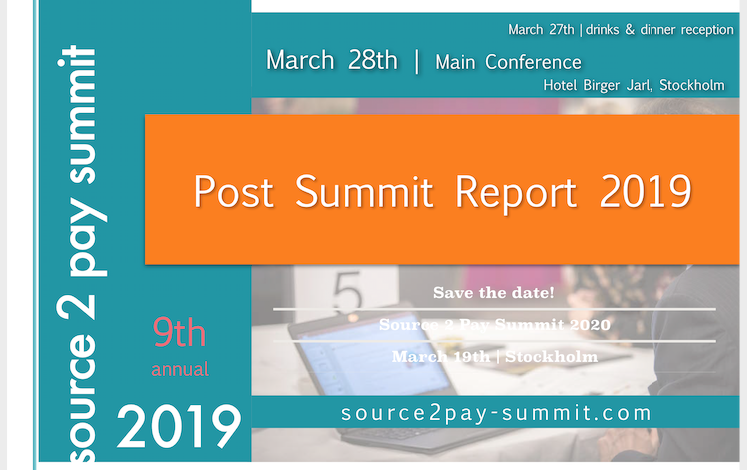 In a few months professionals meet in Stockholm an discuss vital business development aspects from a sourcing, procurement and finance perspective. How much of your company revenue is invested externally? Probably a major part, making Source to Pay topics a vital part of you development. 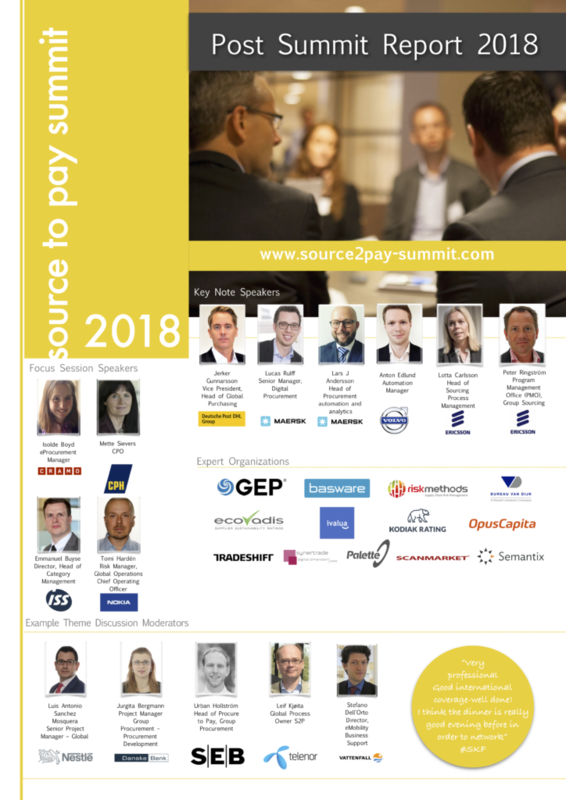 Below the program as of January 10th, more topics will be published and the latest agenda can always be found at www.source2pay-summit.com. As soon as you register you can start choose among the below discussions, first come first served. Getinge Group is a med-tech company with a long history of global expansion through organic growth and acquisitions. Today Getinge Group have over 15 000 employees in 40 countries. In early 2016 all business units were joined together in a common company – one company – One Getinge. The idea being to reduce complexity and ensure an efficient management of the company. 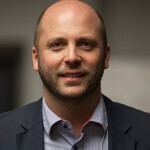 Niclas Sjöswärd is Chief Group Operations Officer at Getinge Group, a central role with a holistic overview over Shared Services, Indirect Purchasing and Program Management Office (PMO). Spend wise indirect procurement and direct/production purchasing share a 50/50 spend volume. Here Niclas will share how Getinge have chosen to organize and make sure acquired companies and overall strategies are realized across organizations globally. How have Getinge chosen to organize and shape their procurement and shared services governance structure? What key factors will ensure the One Company strategy? In what way are stakeholders engaged? What role does technology play making sure strategies are realized? Theme Discussions | Session 1 – Share your experiences! Choose a discussion before the Summit. Your choices will be noted on your name tag. Each discussion have a moderator managing the discussion. Benchmark mean sharing know-how and not getting all the answers and there is a maximum number of seats at each table. Choosing table comes at a first come first served basis. Each discussion run for 40 minutes. 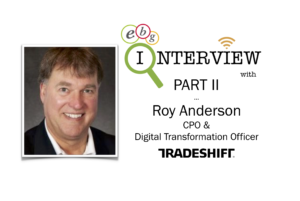 How are current drivers impacting indirect sourcing and procurement? 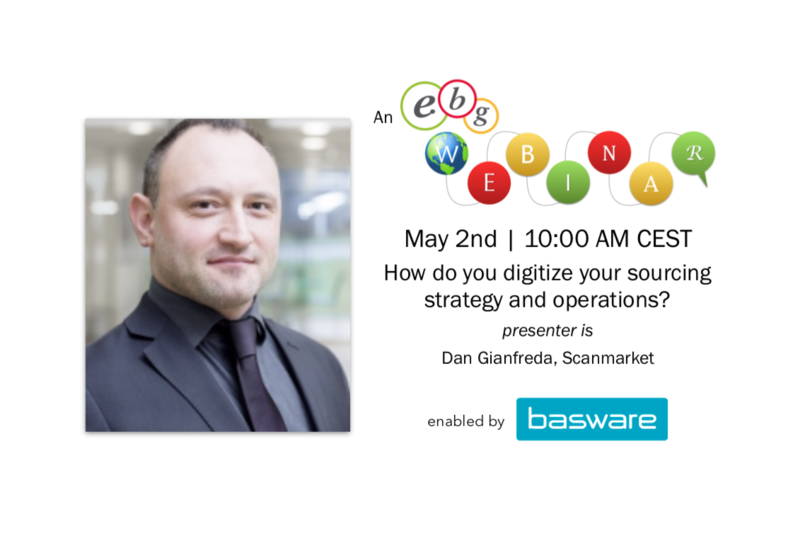 Identify and Implement (simple/practical/low cost) ways to leverage digitalization in inbound supply mgmt. How is Q for quality considered in indirect sourcing? Vestas has embarked on initiatives such as value creation reporting for each category and commodity to enable proper status evaluation and decisions. The structure is ensured by following up sourcing procedures. In this session you will discuss value creation know how. Is sourcing in indirect only driven by cost? From the Getinge Group website; ”Over the past three years, Getinge has experienced a challenging trend. Organic growth has not reached the desired level and profitability has declined. Getinge’s conclusion is that its established strategy is correct for addressing these challenges, but the company’s former decentralized organizational structure made the implementation of Group wide priorities and initiatives difficult. It has also been difficult to leverage scale to the desired extent in the existing structure. Supply chain risk mitigation: a prerequisite for doing future business? What are the key business drivers of sustainable procurement strategy? How do you enable your buyer/purchasing team identify risks? What kinds of indicators or tools? 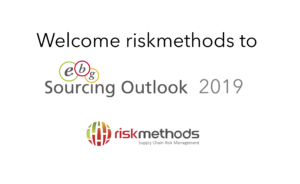 How do you respond to identified ‘risk suppliers’? What are the tradeoffs of various possible actions? What are the biggest challenges working in a de-centralized organization wanting to gain end-to-end control? What steps should you take and how should you monitor your progress? How do you ensure users change behavior in line with a new procurement strategy? Benchmark: How do you measure procurement time and organization efficiency? How do you measure the efficiency and develop targets, with insights from actual time spent on different activities? What effect and efficiency targets are you using? How can procurement create ”360” KPIs (targets affected by reality in a dynamic loop) and follow up? In what ways can you leverage the use of AP/P2P data analytics highlighting inefficiencies and driving process improvement? How can you drive greater collaboration between P2P and Internal Audit teams to protect profits and minimize operational risk? How do you free up resources to elevate the role of P2P, enabling them to add strategic value? What can you do to move from a reactive mode to proactive, preventative actions? Theme Discussions | Session 2 – Learn from each other! Choose a discussion before the Summit. Write down what choices you made. If there is room you can swap tables during the day. Each discussion have a moderator managing the discussion. Take the opportunity to ask your questions and listen to your peers. Each discussion run for 40 minutes. Same discussions as in Session 1! A plenum session where you can listen to and learn from in-depth and to the point practitioner know how. 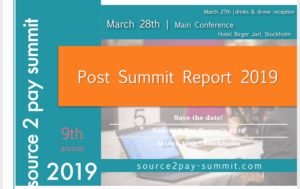 Consider how your organization is making sure business needs are aligned with sourcing, procurement and finance activities and follow up. How much of all the activities along that process happen in silos? Stora Enso have been successful aligning the possibilities sourcing have with predicted and actual business needs and events and so been successful reaching their targets. 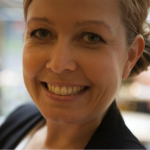 Here Irene Tibbling will share her insights and how and when Stora Enso gather and share those insights. Insights in stead of oversight, transparency in stead of silos and continuity over time. • How can sourcing and procurement move from being re-active to proactive? 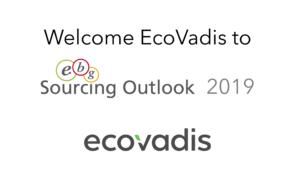 • What does ONE mean in terms of sourcing and procurement activities and targets? • How can you set up a functioning governance model based on internal and external collaboration? • How do you incorporate sourcing/procurement savings in the P&L? Theme Discussions | Session 3 – Discuss strategies and tactics! How do you make sure sourcing activities are linked to purchasing behavior across the business? How do you handle contract management and what tools are used? What can direct and indirect procurement learn from each other within contract management? Most organizations struggle with goods receipt. It is a challenge to link procurement and finance together. If you get it wrong you risk not having either spend nor cost being true. Telia Company has done a thorough analysis internally to understand what the problem really is, possible solutions and will share those insights. Is there a gap between best practice 3-way match and practice? Can one goods receipt solution fit all types of purchases and user groups? The goods receipt dilemma – who should be responsible for correct cost booking in the right period? Which solutions are needed to support the business to do it right? How can you set up data driven systems and processes that add value to the business? How can data be used to stimulate process efficiency? How to implement a strategy around big data? How do you make sure data quality is good enough? Benchmark: Should sourcing, procurement and finance change how processes are set up and communicated? The need to feed procurement strategies with business insights and involvement is increasingly discussed. 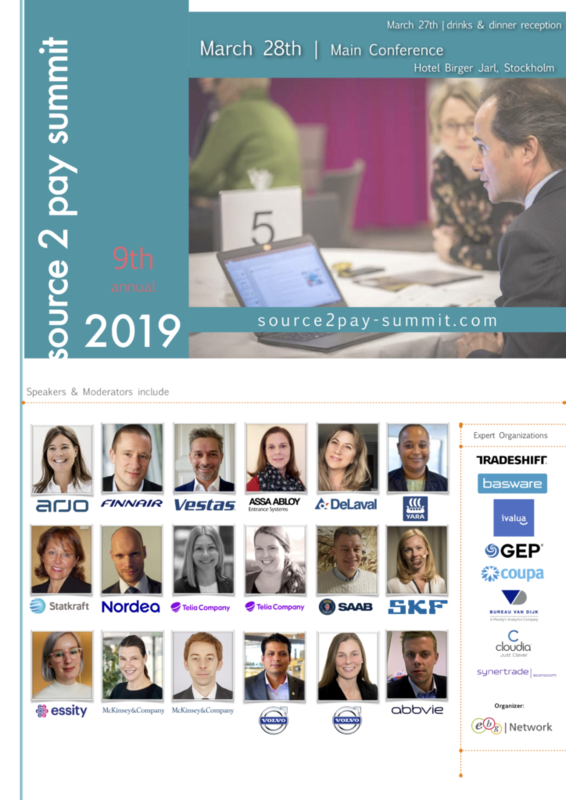 In Novozymes, Indirect Sourcing has challenged their ‘traditional sourcing’ ways of working, and in this session you will discuss indirect procurement development experiences. Especially focusing on pragmatic ways of looking at Easy ways of buying, Cost control and Value ad from a Business perspective. How can you create an efficient and agile way of incorporating business insights? What KPIs feed ”good” pro-active behavior (rather than re-active)? Should procurement change processes to help the business? As a global company, risk assessments are not new but increasingly important in a changing supply landscape with consumer focus on ethical choices and sustainability. Services supply is increasing and suppliers have increased interfaces with customers making an up to date code of conduct vital. In this session you will both learn and be able to benchmark maturity levels with Finnair strategies. What priority criteria are used i.e choosing which suppliers to focus on? Which risk areas are in focus? How do you manage non compliant suppliers? How many tiers is it possible to visualize? How do you manage continuos cost control over professional services? Professionals services are likely to make up a large part of company spend and is often increasing. At the same time salaries tend to increase and annual savings targets become harder to reach. There is a need for both the business and procurement to find ways to lower cost and increase value. 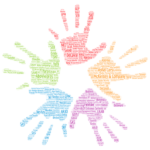 Here you can share experiences and insights and grow knowledge together. 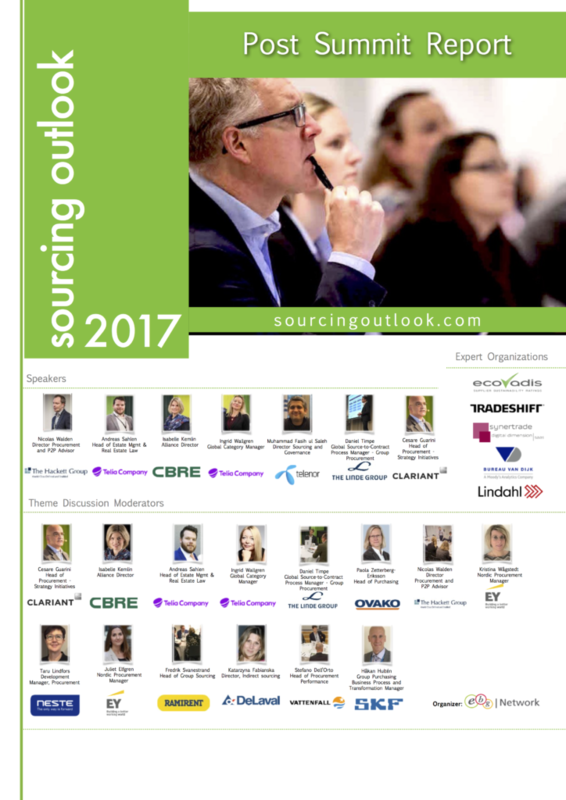 In what ways is sourcing and buying of professional services developing? How do you continue to drive savings impact on professional services? How do you get your stakeholders to contribute and what role should stakeholders have? Increased stakeholder value equal to increased behavior impact? As a Source-to-Pay Global Process Owner (S2P GPO) Cristian holds a role overseeing both procurement and finance globally. In this session he will not focus on the transactional aspects of end to end control but rather the constant challenge in finding the right balance between compliance, efficiency and user-friendliness i.e finding ways of making their life easier and so impacting behavior, reducing cost and adding value. Control versus transparency – why (and how to) measure stakeholder value in the S2P processes? How can sourcing, procurement and finance create value beyond silos? In what ways should the business be able to affect how S2P processes are structured? How to collaborate with an outsourcing partner in change management efforts? In what ways can trust be created between entities and an outsourcing partner? How to communicate the desired outcome with involved entities and outsourcing partner in a global transformation journey? When risk avoidance and transparency are not enough: How to satisfy stakeholders demanding to drive improvements in supplier CSR practices? Risk avoidance in the supply chain is indeed an early stage driver for the sustainable procurement journey. For many companies and industries, however, stakeholders are demanding that companies go further, to drive improvements in their supplier’s environmental, social, and ethical practices. Customers are seeking more sustainable products that will require innovation throughout the supply chain. What are the challenges in understanding supplier performance on these criteria (Env, Social, Ethics, etc.)? What are the success factors to engage both your team, and ultimately suppliers in improving sustainable practices? What opportunities are emerging in your industry for sustainable products? Is your supply base ready to deliver on these? What tools and policies are used to execute a strategy? How do you create closed loop spend management? 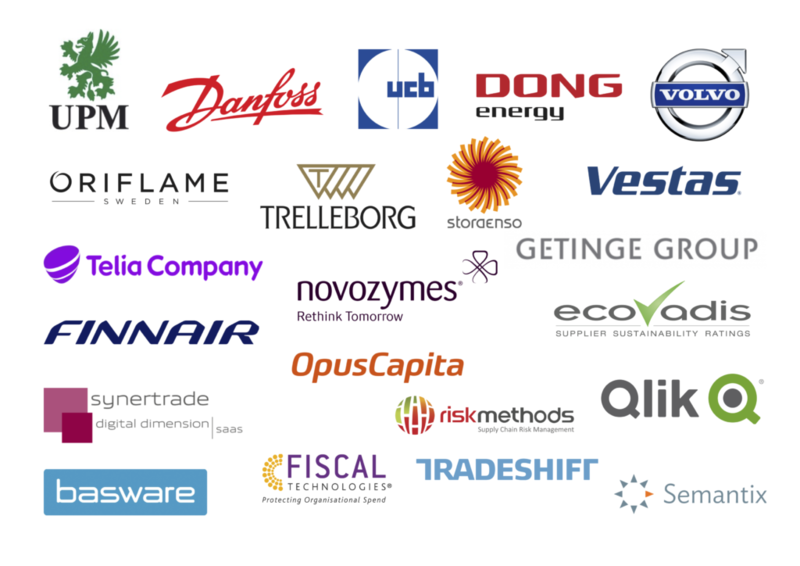 During a webinar enabled by Qlik, Irene shared her Stora Enso sourcing insights. It turned out that access to relevant data, too few dedicated resources and lack of internal focus were common challenges. In this discussion you can discuss how to overcome challenges and enable full circle spend overview. 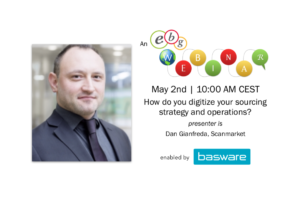 • How have you integrated sourcing activities with budgets and business needs? • What does your sourcing governance model look like? • How are you communicating with business stakeholders what sourcing and procurement can enable? Theme Discussions | Session 4 – Compare road maps ahead! Choose a discussion before the Summit. Write down what choices you made. If there is room you can swap tables during the day. Each discussion have a moderator managing the discussion. Take the opportunity to ask your questions and listen to your peers. Each discussion run for 40 minutes. Same discussions as in Session 3!